I want to drag and drop path on HTML5 canvas. I didn't find any thing like SVG provides events if we click on shape. Anyone know how I can handle events on path item here? I want to do this without any java script library. In order to detect line-clicks we need to record all path information. The following example is a modified version of the code provided in original post and includes a stroke recorder which records each stroke (between mouse down and mouse down) to an array which contains all strokes. For simplicity we listen here to mouse clicks when we alter mode. When in click mode we iterate the stroke collection and re-build the paths we previously recorded for then to check if our mouse position is in one of these lines. In order to record we need to modify the existing callbacks. 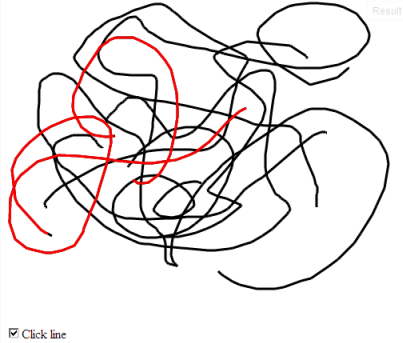 There is also a bug in it which causes the line to be redrawn of top of each other for each mouse move which eventually will slow down the drawing if the line is long. An old quesition, how to determine a point in a irregular shape? HTML5 Canvas + select / drag-and-drop features in a JS lib?